Renovated like new! 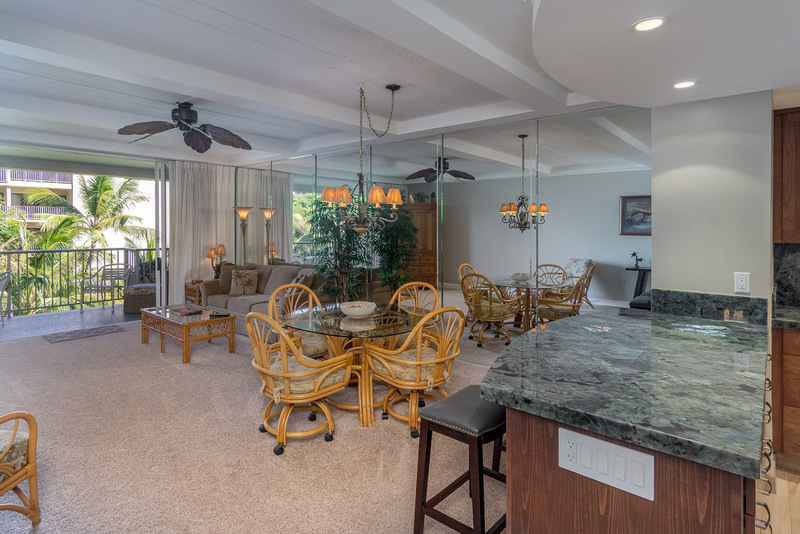 Stunning - that is the first thing you will think when you see this beautiful Whaler condo on world famous Kaanapali Beach. Whaler 420 was renovated from top to bottom and was just completed in November of 2016. So, Whaler 420 looks and feels brand new. 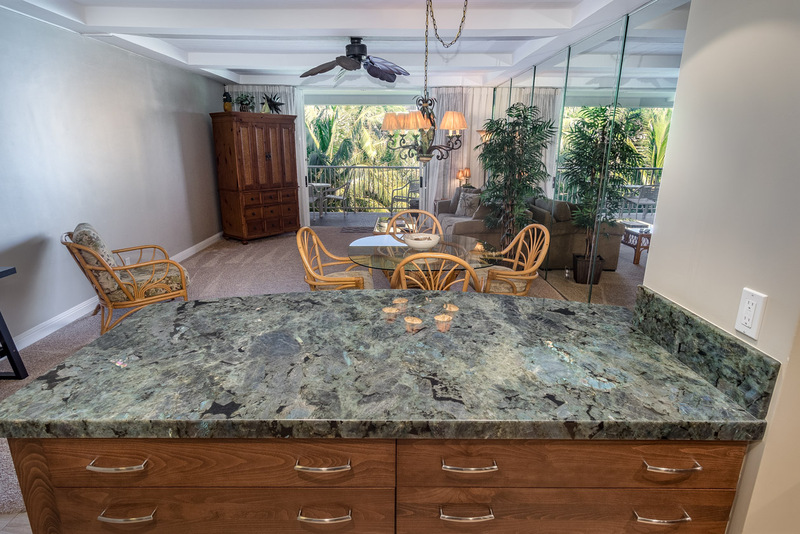 The striking Lemurian Blue granite highlighted with iridescent deposits of abalone shell will immediately attract your attention, and it speaks to the quality of the rest of this renovation. But we’ll come back to that, because you will want to see the view. 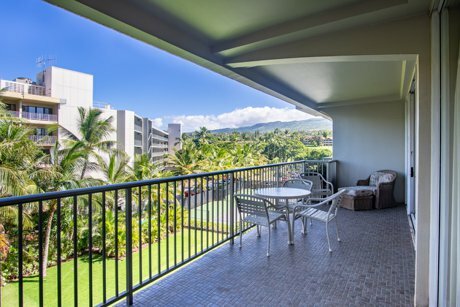 Your lanai is on the cool, quiet north side of the Whaler. The view is set back from the beach but plenty close to see and hear the white water breaking on the beautiful sandy beach. You can watch the waves, the people, and the whales and enjoy the colorful sunsets. Another advantage to this location is that you also get a beautiful view of the green West Maui Mountains. 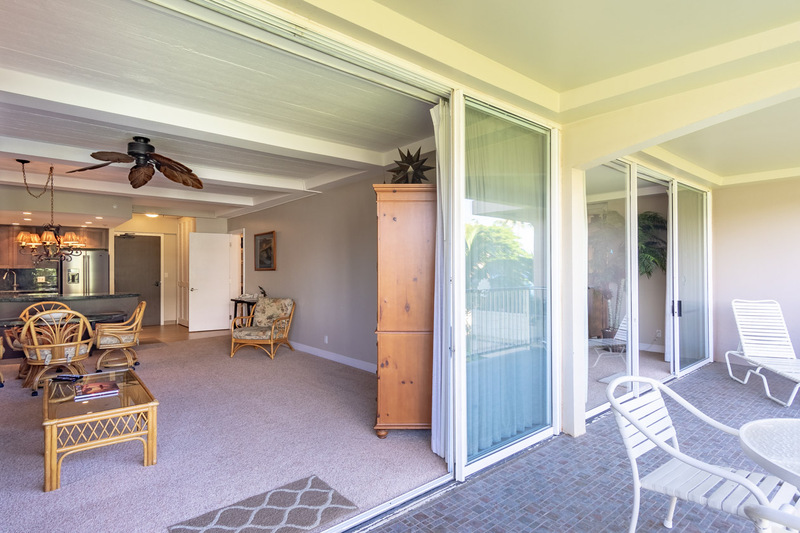 The lanai itself is a long comfortable space set up with 2 lounging areas, and it is accessible from either the living room or your master suite. Speaking of comfortable spaces, this is not your ordinary 600 square foot Maui condo. 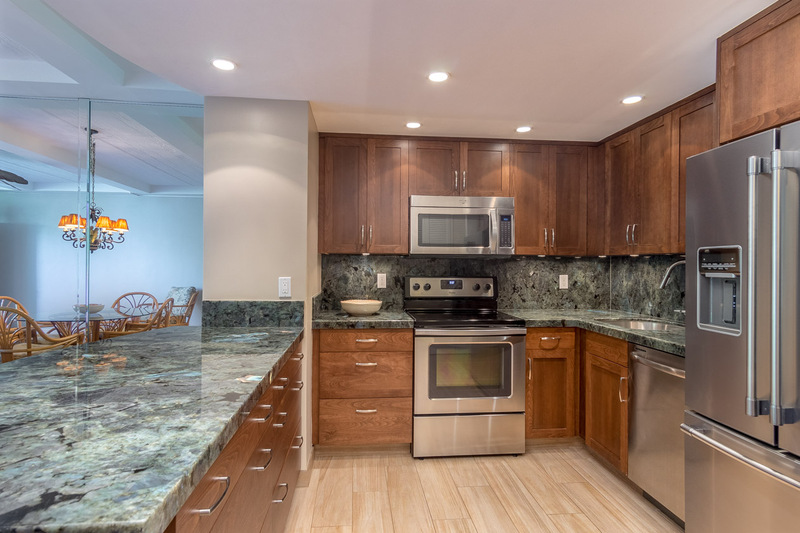 Whaler 420 is an extraordinarily large one bedroom condo with over 900 square feet of comfortable living space. 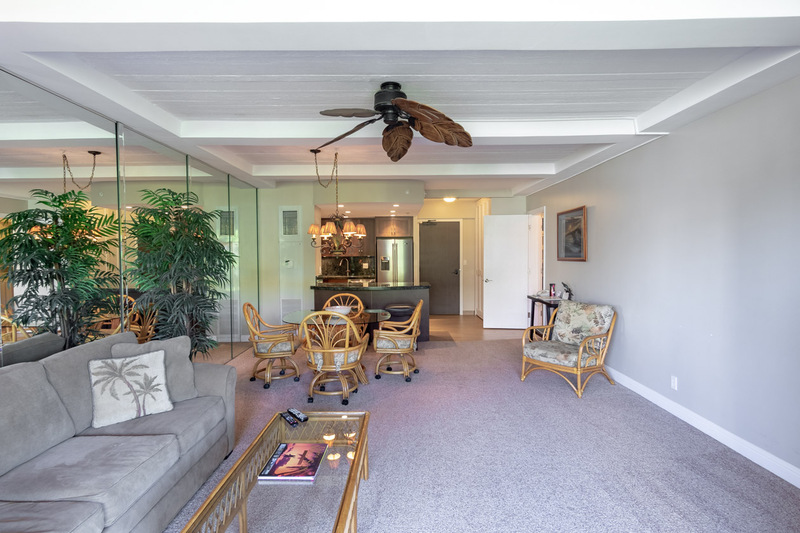 The great room offers plenty of space to gather family and friends for fun dining experiences or parties that can easily spill out on to that large lanai. It is big enough and well equipped enough that you could easily prepare Thanksgiving dinner or have a private chef (we can give you one or 2 suggestions if you like) in to prepare a gourmet meal for you. But with the fabulous restaurants right downstairs in Whalers Village, you will certainly want to enjoy dining out from time-to-time. Of course, you don’t have to have guests over all the time. Whaler 420 can also be your own quiet retreat. 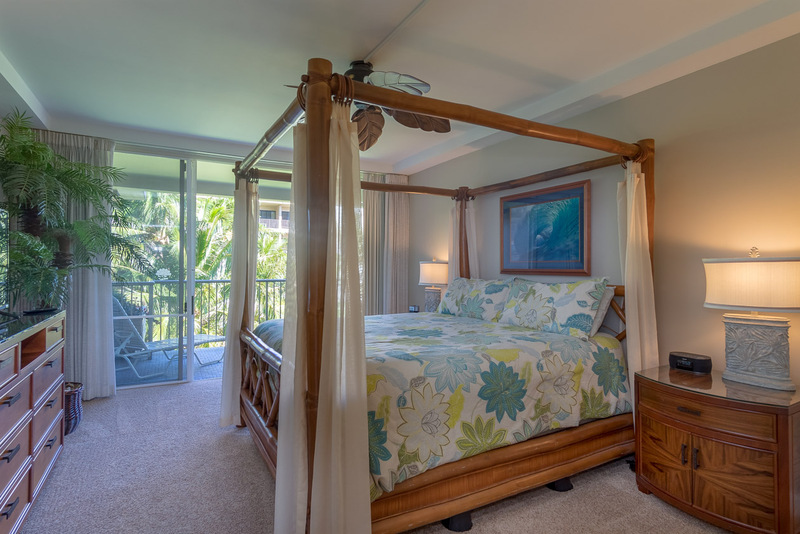 The master suite opens to the lanai, where you can be serenaded by the sound of the waves and Maui’s doves. The romantic 4 poster bed adds just the right touch for this setting. 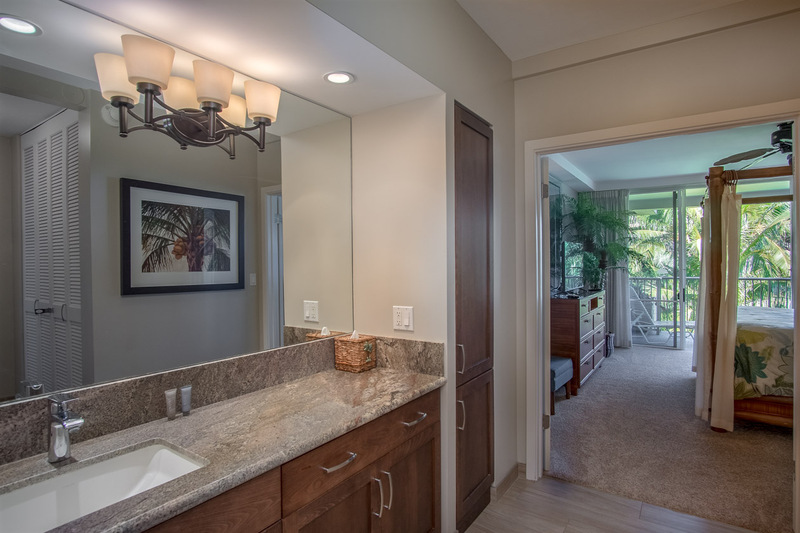 The master suite opens to the master bathroom. 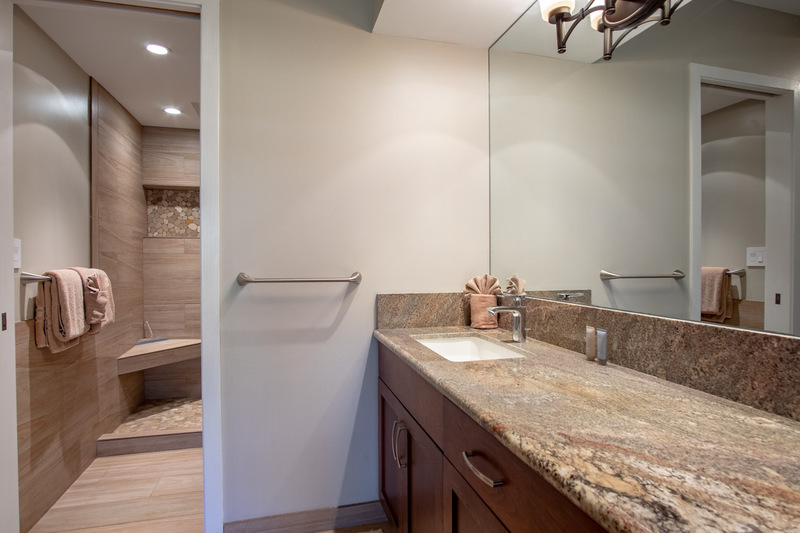 The large solid wood vanity is topped with beautiful natural granite and backed by a well-lighted dressing mirror. 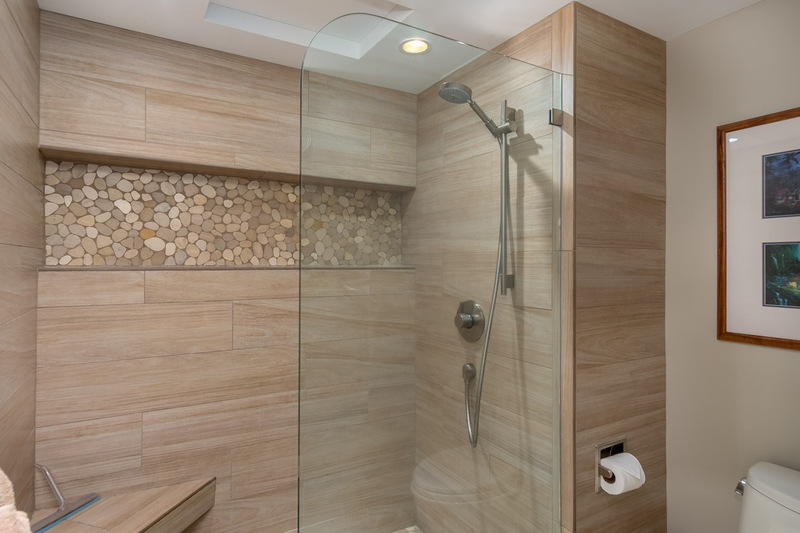 The floors are beautiful, durable porcelain tile that look like a wood grain. The owners took advantage of that beautiful tile and carried the theme into the walk in shower and enclosed the shower with the combination of the porcelain tile and river stone tile to create a peaceful relaxing space inside the oversize shower. And now, back to that gourmet kitchen. The Lemurian Blue counter is reflective of the beautiful Pacific Ocean that you can see right from your lanai. 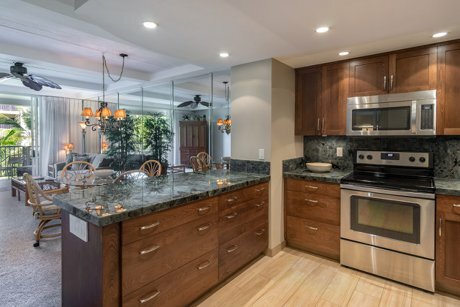 The cabinetry is all custom quality hardwood that will hold its beauty for a long time. 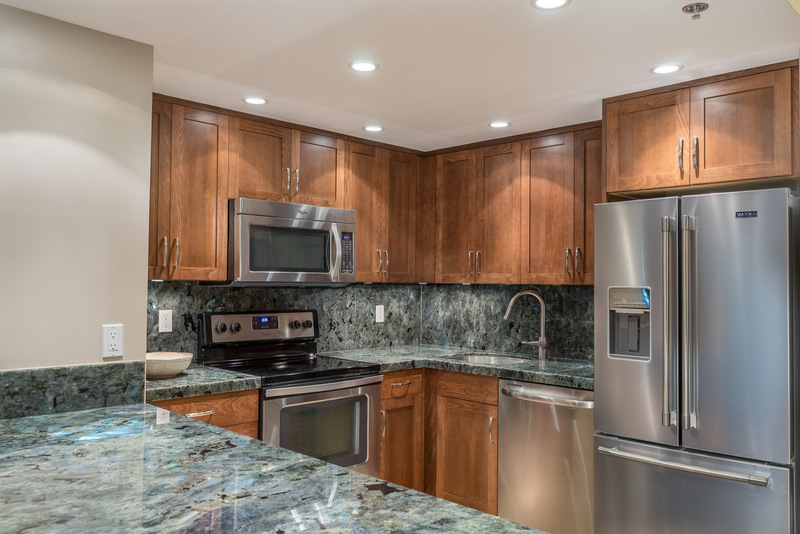 The backsplash is appealing glass tile and the appliances are easy to care for stainless steel and just 2 years old. 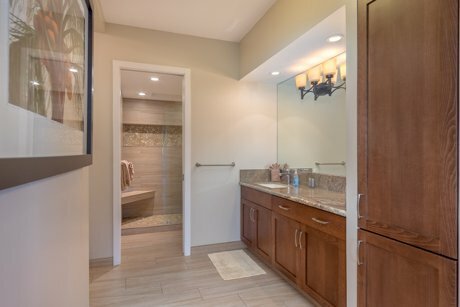 The flooring is the same porcelain tile that runs down the hallway to the master suite and the master bath. Finding a good, large storage space on Maui is rare, but finding a good large storage space with a laundry is rarer still. 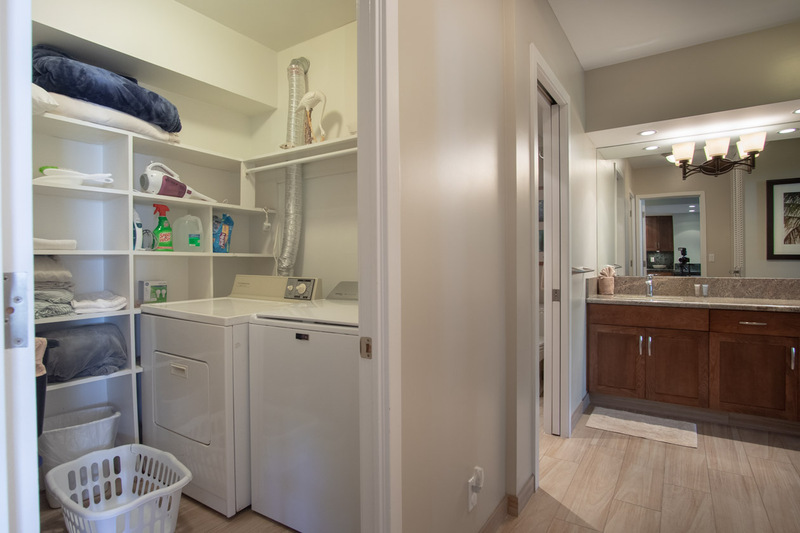 At Whaler 420 you not only get a laundry room with lots of storage space and a washer and dryer inside your condo, you also get a second generous space that you can use as a locked owners closet. Of course the setting for your condo couldn’t be more beautiful. 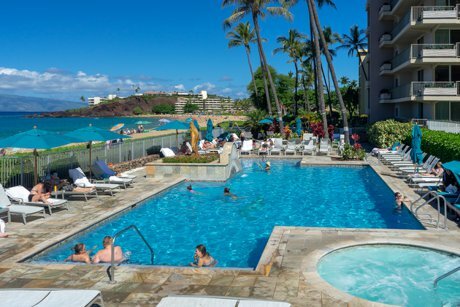 The complex opens to one of the best beaches in the world, Kaanapali Beach. The interior courtyard of the Whaler is dominated by the green belt and a peaceful koi pond. One of its most special features is the oceanfront pool. 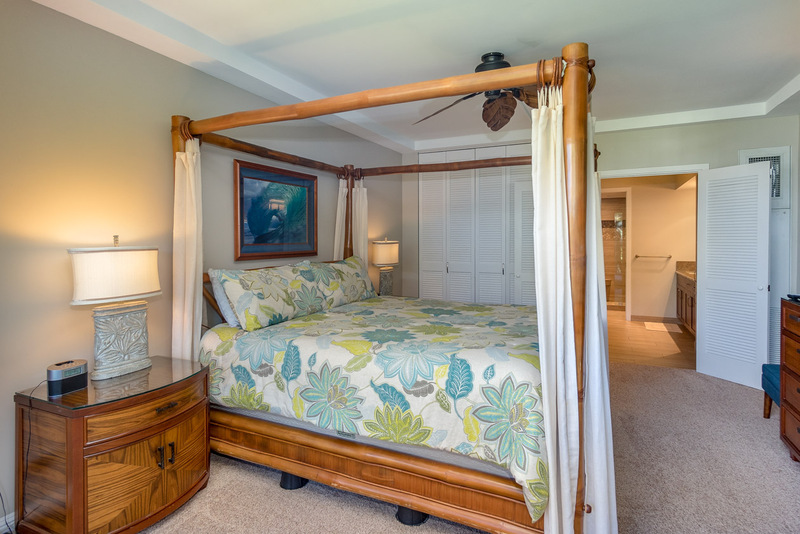 It is the perfect location just off the sandy beach and a great spot for a tranquil morning or afternoon. And with all of this relaxing, you might think it would be hard to stay in shape, but the Whaler has thought of that as well. That’s why you have access to the full gym with all new equipment. But if you’re not into the gym, there are beautiful long walking paths up and down Kaanapali Beach. World class shopping as well as local and gourmet dining are just a short stroll down the beach. And frequently you will want to interrupt your walk to catch the free local music played by top Maui artists. 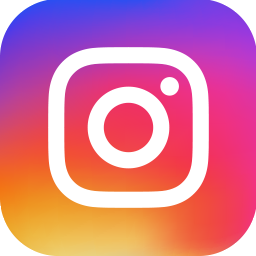 If you are feeling a little more adventurous there are several snorkel, sunset and whale watching trips available right off the beach in front of your condo. 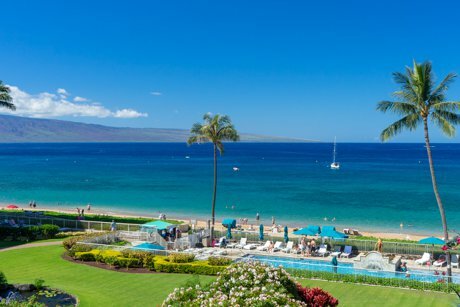 You can also take advantage of golf at the world class Kaanapali Golf courses just across the street. Kaanapali has been home to PGA tour events including the famous Skins Game. 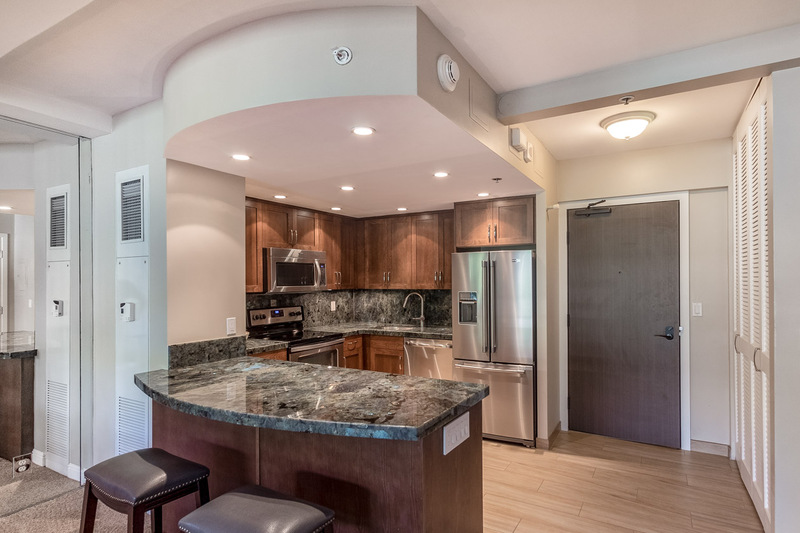 Your condo, 420 at the Whaler, will be your center for fun, relaxation, romance, and there is a good chance you can turn a profit as well. 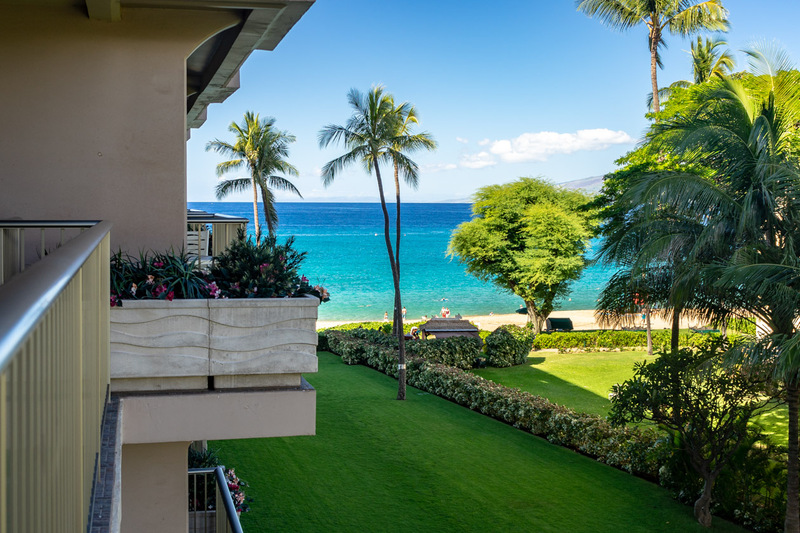 Aloha Group Maui - Keller Williams Realty Maui can help you buy, sell, or exchange a home or condo - for you to live in full time, part time or as an investment. 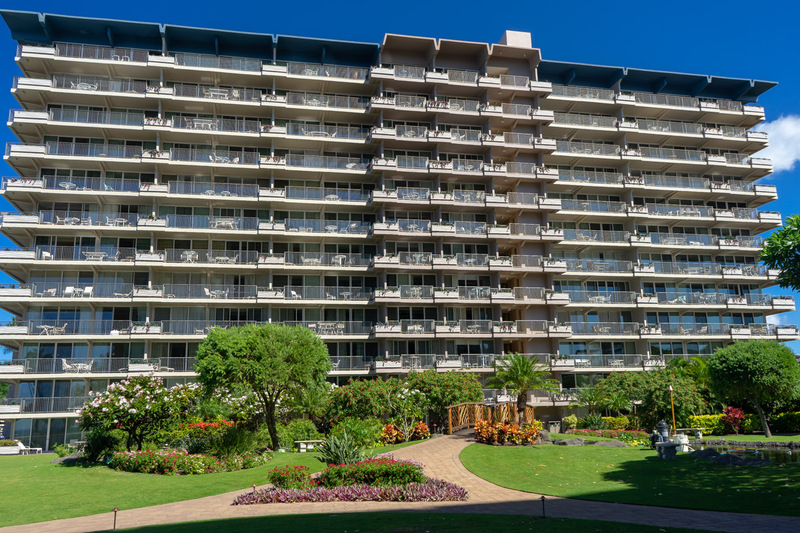 Learn more about Maui Real Estate in our Maui Real Estate 101 resources section. 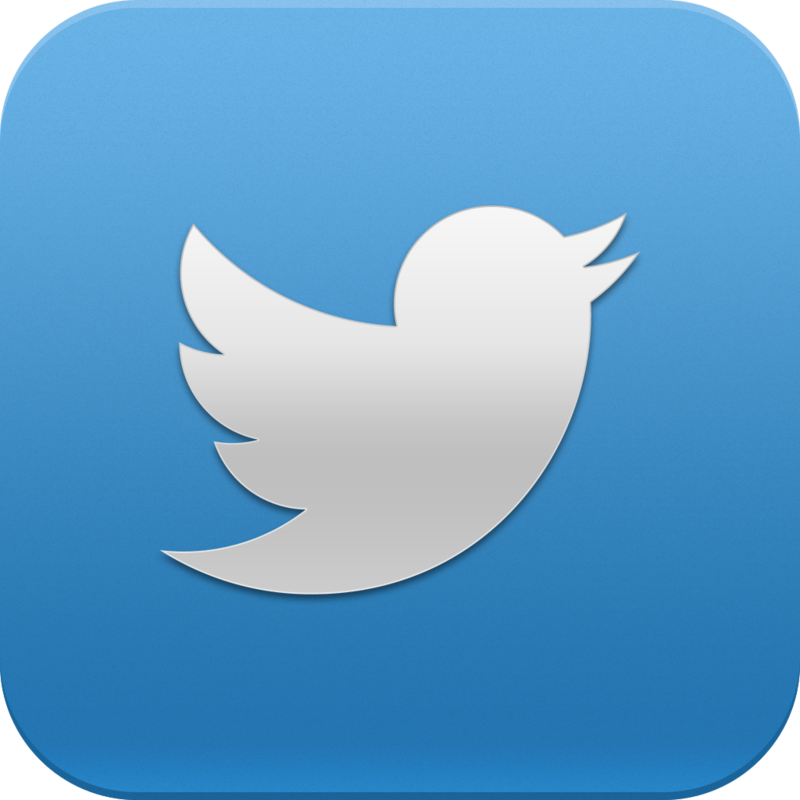 Stay informed of market trends by reading the Maui Real Estate Advisor. 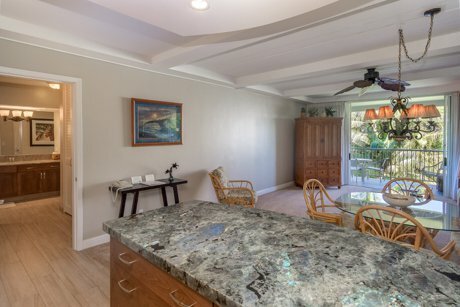 We are your Maui Real Estate Professionals.